These days it seems like people from all walks of life have tattoos, which might lead you to believe that tattoos are completely safe. But there are health risks that can result in the need for medical care. The Food and Drug Administration (FDA) is particularly concerned about a family of bacteria called nontuberculous Mycobacteria (NTM) that has been found in a recent outbreak of illnesses linked to contaminated tattoo inks. M. chelonae, one of several disease-causing NTM species, can cause lung disease, joint infection, eye problems and other organ infections. These infections can be difficult to diagnose and can require treatment lasting six months or more. Some of these contaminated inks have caused serious infections in at least four states in late 2011 and early 2012. 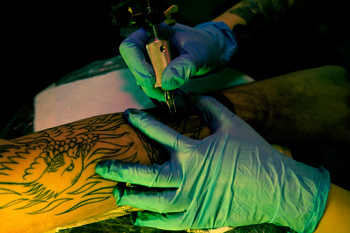 FDA is reaching out to tattoo artists, ink and pigment manufacturers, public health officials, health care professionals, and consumers to warn them of the potential for infection. FDA also warns that tattoo inks, and the pigments used to color them, can become contaminated by other bacteria, mold and fungi. To raise awareness and make diagnoses more accurate, FDA strongly encourages reporting of tattoo-associated complications to its MedWatch program, says Linda Katz, M.D., M.P.H., director of FDA’s Office of Cosmetics and Colors. Getting the word out to tattoo artists is particularly critical. Even when they diligently follow hygienic practices, they may not know that an ink itself may be contaminated. Contamination is not always visible in the inks, Katz says. FDA’s goal is to encourage these artists to take certain precautions in their practice and to urge potentially infected clients to seek medical care. “Reporting an infection to FDA and the artist is important. Once the problem is reported, FDA can investigate, and the artist can take steps to prevent others from being infected,” says epidemiologist Katherine Hollinger, D.V.M., M.P.H., from the Office of Cosmetics and Colors. Tattoo inks are subject to FDA regulation. FDA investigates and intervenes when a serious safety issue arises. And that’s what happened here. FDA’s CORE (Coordinated Outbreak Response and Evaluation) Network initiated and coordinated the investigation with state and local health departments and laboratories, the Centers for Disease Control and Prevention (CDC), and FDA investigators working in numerous district offices. The investigation began in January 2012, when FDA, through its MedWatch reporting program, learned about seven people in Monroe County, NY, who had NTM infections. They’d all gotten tattoos from the same artist, who used the same brand of ink on all of them. The infections occurred on the newly acquired tattoos, with red bumps appearing soon after the tattoo had healed. FDA later learned of 12 more people with an NTM infection who were also clients of this same tattoo artist. The same brand of ink was also used on them. Of these 19 people, 14 were confirmed to have the same type of NTM infection. An NTM sample from a sealed container of the same type of ink used to tattoo the affected individuals was a perfect match to the NTM linked to these infections. Meanwhile, FDA learned of outbreaks of NTM infections in other states, including but not limited to Washington, Iowa and Colorado. The cases in these states involved different NTM species or different ink manufacturers than those in New York. While the infections in Washington, Iowa and Colorado were not linked to the New York infections, there was a link identified between the M. chelonae infections in Washington and Iowa. For the New York outbreak alone, FDA investigators visited the tattoo ink supplier and manufacturer. These were located as far away as California. These investigations resulted in a recall of the implicated ink. Tattoo artists can minimize the risk of infection by using inks that have been formulated or processed to ensure they are free from disease-causing bacteria, and avoiding the use of non-sterile water to dilute the inks or wash the skin. Non-sterile water includes tap, bottled, filtered or distilled water. Consumers should know that the ointments often provided by tattoo parlors are not effective against these infections. NTM infections may look similar to allergic reactions, which means they might be easily misdiagnosed and treated ineffectively. Once an infection is diagnosed, health care providers will prescribe appropriate antibiotic treatment according to Katz. Such treatment might have uncomfortable side effects, such as nausea or gastrointestinal problems. However, without prompt and proper treatment an infection could spread beyond the tattoo or become complicated by a secondary infection. Contact your health care professional if you see a red rash with swelling, possibly accompanied by itching or pain in the tattooed area, usually appearing 2-3 weeks after tattooing. Report the problem to the tattoo artist. Report the problem to MedWatch on the Web or at 1-800-332-1088; or contact FDA's consumer complaint coordinator in your area. using tattoo inks past their expiration date.